Sean Dorney, the ABC foreign correspondent who covered Papua New Guinea and the Pacific region for 38 years, is highly regarded and much loved, especially in his home state of Queensland. It was no surprise then that a sell-out audience gathered on March 12 in Brisbane to hear Sean deliver a speech titled Australia’s welcome re-engagement with PNG and the Pacific. 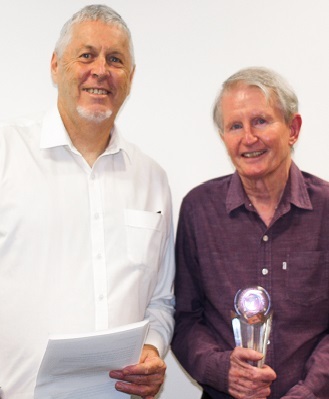 AIIA Queensland was honoured to host Sean who, in November 2018, was recognised as an AIIA Fellow for his exceptional contributions to Australia’s international relations. And AIIA Qld secretary David Costello was delighted to present Sean with his impressive Fellow trophy. Those in the audience who grew up listening to Sean’s reports were moved by his presentation, which coupled his characteristic humour with deep insights. The fact that he been both deported from and honoured by PNG is a testament to his unique and dynamic life experience. Many Australians today are entirely ignorant of the fact that Australia maintained colonial rule over PNG for almost 70 years, a theme Sean explores in his book The Embarrassed Colonialist. He reminded us of the talk in contemporary media of Indonesia being our closest neighbour, forgetting that parts of Australia are just kilometres away from PNG. While many in PNG have an extensive knowledge of Australia and its people, we know little of our neighbour. Australian politicians have long treated the Pacific with benign neglect, regarding it as a “strategic backwater’’. Sean joked about the fact that people in PNG have a hard time keeping up with Australia’s chaotic politics and frequent leadership coups. PNG Prime Minister Peter O’Neill has held office since 2011 while Australia has had five different PMs in that time. Sean is disappointed in what he sees as the Australian media’s abysmal coverage of the Pacific. As a journalist, he put the spotlight on the region. Today, important stories are getting little coverage. He drew attention to an oil-spill disaster in the Solomon Islands where the Hong Kong-flagged Solomon Trader ran aground on February 5. The spill threatens the livelihoods of people on the World Heritage site of Rennell Island, which is the largest raised coral atoll in the world. Sean asked what is happening to the 40 Maserati cars that the PNG government purchased for the APEC Summit last year? And what is the situation on Bougainville’s independence referendum? Sean sees many stories, but scant coverage. Sean also talked about Australia’s recent “pivot to the Pacific’’. Canberra has refocused its attention on what we call “our patch’’ in the face of increasing Chinese investment and involvement in the Pacific. The governments of Pacific nations mostly welcome this Chinese attention, and Sean says it has positive effects, one being to draw Australia’s attention back to the “strategic backwater’’. Pacific nations, including PNG, have called for Australia’s help particularly in the education sector. Many stories illustrate the region’s problems, but Sean believes that the most effective assistance Australia can render to our Pacific neighbours is to send teachers and lecturers, to train teachers, to receive students, and to engage in long-term aid for these developing nations.